Tubal reversal surgery has different names like tubal ligation reversal and Microsurgical Tubal Reanastomosis. The surgery is done for repairing the fallopian tubes. It is a safe outpatient surgery which has greater success rates depending on the experience of the surgeon. There are different ways to perform the surgery, but the purpose of all techniques is same i.e. to repair the damaged sections of the tube. A skilled surgeon can predict your success of pregnancy after your Tubal Reversal is done. As it is described that tubal reversal is an outpatient surgery, so it means that the patient can return home on the same day the surgery is performed. In other words, it is also known as same day surgery. But the patients who travel from far areas to get their treatment done have to stay overnight in some clinics but if a clinic does not offer overnight stay, the patient has to stay in any hotel to be safe. Some hotels offer discounted rates for the patients who travel from distant places like out of city or country. The surgery is completed in one and a half hours but the time usually depends on the clinic or tubal reversal center from where you are going to have your surgery. You may ask your surgeon about the time of your scheduled surgery. Some women have a concern that whether it is possible to have a tubal reversal after many years or not. It depends on the ligation that was done by the surgeon years back. Older surgeons had used old techniques which may have given more damage to the tubes. If the tubes are damaged more than ligation reversal is not possible. The doctor after reviewing the operative report of the patient can determine if it is possible to reverse the tubal ligation or not. Sometimes scar tissues form and reduce the success rate of the pregnancy. Years don’t matter but the condition of the tubes matter. Many women had their tubal ligation almost 20 years ago, and they are found to be good candidates for the tubal reversal surgery. Like every surgery, tubal reversal also carries some risks. Sometimes there is an abnormal blood loss, and sometimes the patient is exposed to potential infection. In some cases, there are some complications with anesthesia, and some patients have their other organs damaged during the surgery. But overall the surgery is safe, and the risks are not very common. The standard risk includes the infection, but the doctors usually gave antibiotics during the surgery to reduce the chances of infection. The major risk is the occurrence of ectopic pregnancy. This is because the scarring in the fallopian tubes lead to ectopic pregnancy because the embryo finds difficult to move through the tube. If some patients experience an ectopic pregnancy, it must be handled with great care. Sometimes patients experience miscarriage after the pregnancy. So, if the patient finds her pregnant after the tubal reversal surgery, she must take care of her. Hundreds of tubal reversal surgeries are performed annually. Some are carried out soon after delivery and others are done either by laparoscopy or by mini-laparotomy. The process involves damaging the tubes either by burning, cutting, or using rings or clips. This method prevents the women from getting pregnant. Later in life many of these women find themselves wishing to have children again. Different reasons include a new marriage, divorce, loss of children, just the feeling that they need a larger family. So the surgery of tubal reversal reconnects the tubes through different methods. New techniques and instrumentation are now used to perform this surgery. Laparoscopy and mini-laparotomy are the two main methods that are commonly used by the surgeons. The success of the surgery depends on the female’s age, type of ligation, the health of the tubes and male partner’s fertility at the time of the operation. Laparoscopic tubal reversal is a highly efficient method for the patients under 35 years of age. Each woman is different depending on the different factors. The Laparoscopic tubal reversal is a technique of minimally-invasive surgery. It involves the use of special small instruments for repairing the damaged fallopian tubes. These are the micro-instruments that involve experience and skills in their use. After administering general anesthesia, a 10mm tube is inserted just at the navel’s lower edge, and a special gas is introduced into the abdomen for creating some space. This act helps in performing the surgery safely. The same tube is used to insert the laparoscope with a camera into the abdomen and the pelvis. The tubes are then examined in this way. The occlusion is removed with three small instruments, and then the two segments of the tube are connected. The alignment of the tube is improved by inserting an instrument in the womb to thread the tube with a stent. Very small sutures are then placed for connecting the segments of the tubes. In the end, the blue dye is inserted into the tubes through cervix and uterus to check if the tubes are properly connected or not. The instruments and the air are then removed from the abdomen. The treatment is then completed, and after some hours the patient is discharged. The stitches are then removed after 5-7 days. Usually, there are dissolvable stitches, and there is no need to remove them as they get dissolved under the skin. It is an affordable method of tubal reversal in which a 2 to 4” cut is made after shaving the hair, and it is a large incision, and the patient takes two weeks to recover. Some patients start recovering after a week and also return to their work. The scar of the incision remains visible after healing too. If we compare these two techniques, we will say that the preferred technique of the surgery is a laparoscopic tubal reversal because the recovery time is shorter and the patient also feels less post-operative pain. The patient also recovers soon early in a week. Tubal ligation is considered the most common birth control method. Following tubal ligation, the wish to have more children is the main reason for regret. Women with young age have a higher possibility of disappointment. There are many surgical options available for tubal reversal, including laparoscopy, laparotomy, and robotically assisted tubal reversal. The technology of robotic surgery is used more in complex benign and cancer-related gynecologic surgeries. It is a minimally invasive procedure. In robotic tubal reversal a robotic technology, a combination of high-definition 3D magnification and miniature instruments are used for enhancing the skills of a reproductive surgeon when repairing a fallopian tube of a woman. In this procedure, tiny incisions are made in the abdomen for the slender robotic arms. The tools that are used are also tiny. Robotic tubal reversal consists of four wristed arms. One arm is equipped with a high definition 3-D magnification camera, the other acts as the surgeon’s arms and an optional arm to hold back tissue. It means the hands of the surgeon control the instruments in the arms of a robot which assists its rotation in all directions. The details are obtained with the help of the camera which also gives the robotic hands’ broad range of movement. There are many benefits of this enhanced visualization, dexterity and exactness when the fallopian tubes are delicately reconstructed to restore the lost fertility of a woman. These enhanced capabilities ease surgeon fatigue and mechanics help in constant movements. The doctor conducts the robotic arms remotely even if he is seated at the console, and is far away from the patient. These are the significant benefits of the robotic surgery that helps the smooth and effortless movements and the wristed capabilities of the robotic arms. In this case, there is a less loss of blood which is considered as the biggest benefit of the surgery. The patient usually feels some pain after the surgery. Post surgical pain is a very average condition but brings discomfort to the patients. But in robotic surgery, the patient feels less pain and stays comparatively comfortable. Less medication is required in this technique whereas, in other methods of tubal reversal, the patient has to take more medicines. Every patient is concerned about her recovery time. Everyone wants to recover soon. If the tubal reversal is performed through robotic technique, the recovery time is fast, and the patient can resume her normal activities in less time as compared to other techniques. This is the most significant benefit of the surgical technique. Surgery results in scarring. As it is said, the less scarring is the best scarring. The advancement in the surgery helps in less scarring. The less advanced technology will make the greater degree of scarring. There is a fear of complications in every surgery. The difficulties are connected with the surgical techniques. In robotic tubal reversal surgery, there are only a few chances of complications. Fallopian tubes carry the egg from the ovary to the uterus. They are very delicate and any damage can lead to serious injury. Any blockage or damage to the fallopian tubes prevents the occurrence of pregnancy. Sometimes the tubes are burned, cut, tied or damaged intentionally for the purpose to prevent pregnancy. When the tubes are occasionally closed by burning them through a surgery, the procedure is known as tubal ligation. The couples who decide not to have children any more undergo tubal ligation. Tubal ligation is the process of tying, burning or cutting the tubes. Tubal ligation is performed during c section. The burning of the tubes is known as coagulation. It is not always bad to burn the tubes. Surgeons prefer burning the tubes rather than cutting or tying because if the tubes are cut, the internal bleeding may cause ay complication. When the tubes are cut, a suture is placed around the ends to tie the tubes. The suture will help in preventing the bleeding and promote healing. The suture is very fine and thin just like a hair. The needle is also very tiny to connect back the tube. The tubes don’t grow again and cannot be reconnected without repairing them. There are different techniques of tubal ligation and the outcomes of tubal reversal also depend on the ligation performed. When tubes are burned, doctors usually use a 2 to 4 point burn over each tube which can be easily reversed. The pregnancy rate after the tubal reversal in case of burned tubes is higher as compared to other techniques. The tubes are also closed with the tubal rings and clips. A surgery which restores the fertility of a woman to help her in getting pregnant once again after the ligation is the tubal reversal surgery. If the tubes are tied with rings or clips, it is very easy to untie the tubes. When the tubes are reconnected or repaired, the pregnancy can occur. The doctors require the patients to bring their operative reports with them. If the pregnancy occurs, there is also a risk of tubal pregnancy. Sometimes the tubes are cut and the remaining part of the tubes is not adequate. The short tubes don’t help in getting pregnant. Tubal reversal is also known as microsurgical turbo tubal anastomosis. Sometimes women who had tubal ligation suffer side effects which become unbearable for them. In order to get rid of the side effects, they need a tubal reversal. Many women say that tubal ligation is only a bad experience and they suffer from a lot of problems after that. So they want to reverse it in order to ease the problems. As the fallopian tubes can easily get damaged so the surgeon has to be very expert in this field. It is a microsurgical procedure so if you want to reverse your tubal ligation you should always choose the surgeon who has experience in microsurgery. a Reproductive Endocrinologist is supposed to be the professional surgeon of tubal reversal. In the United States above 650,000 women go through tubal annually. 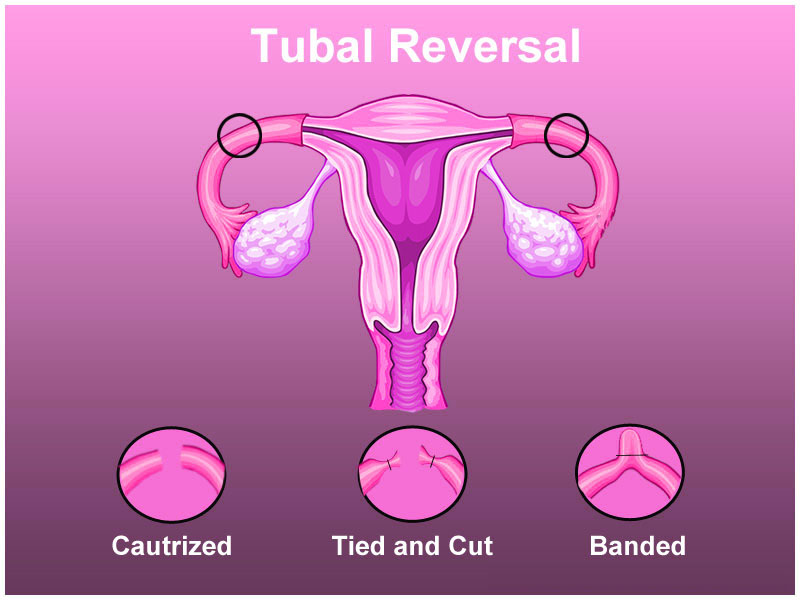 Tubal ligation is the process of tying the tubes through surgery. This is done to close the fallopian tubes of a woman so that she does not get pregnant. But in many cases, some women regret this decision soon after some time. Tubal ligation is known to be a permanent birth control method and is not taken as a temporary contraception method. The latest technology has introduced some alternatives for a woman if she has changed her mind and wants to get pregnant again. It is ultimate in microsurgical technique and is, in fact, one of the most challenging procedures in medicine. Tubal ligation reversal is the best option to reconnect the fallopian tubes. Out of 100 women who had the tubal reversal, about 50 to 80 women can conceive. There are many reasons why many women choose to reverse tubal ligation. One reason is the side effects of the tubal ligation. There are many side effects and complications of this ligation procedure that vary from woman to woman. Many side effects start appearing soon after the procedure, and some appear after some time. So many women to get rid of these side effects undergo tubal reversal. The surgery is done by laparoscopy. Laparoscopy is used very commonly, and surgeons also do the laparoscopy to remove a gallbladder and repair hernia. Tubal reversal is a safe procedure, and the risks that are involved in this procedure are also low if you have good reproductive health. The risks are associated with the surgery as well as general anesthesia. There is also a risk of ectopic pregnancy after the tubal reversal, but the risk is not too high. Doctors consider some factors like female age, tubal length, and partner’s sperm count before suggesting this surgery. Besides some risks and complications, there are several benefits of this reversal surgery too. One major benefit is that it allows natural conception. The patient has to pay a one-time fee, and there is no need to use fertility drugs. The patient also needs not to visit the doctor several times. There are many clinics and hospitals in which the surgery of tubal reversal is done. Nowadays surgeons use the latest techniques to perform this procedure. It can be done anytime, and the candidate will be able to have multiple pregnancies after the surgery.